Endless Hidden Object fun with thousands of clues to find! Tired of long-winded stories? You cannot wait to let your eyes feast on an abundance of hidden object scenes? 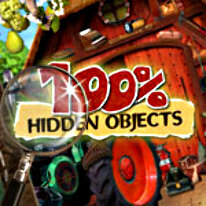 100% Hidden Objects offers different styles of Hidden Object scenes to choose from. No matter whether you feel more enthused by following a search list in classic mode or whether you want to find the object matching the picture silhouette: you can have it all! Indulge in some relaxing pastime or engage in a challenging race against the clock.